PPM Gazelle Swamp Buggy. They can see suspension by rubber blocs. Pict Francis Pierre, Moerdjik, The Netherlands, in 2000. PPM Gazelle Swamp Buggy. Pict Francis Pierre, Moerdjik, The Netherlands in 2000. Sno-Motor. Pict Francis Pierre, 1998. Sno-Motor, 1938-1949, of Ted Flynn of Forest Service, Portland, Oregon. See Chap 'Changes around the track I'. Pict Francis Pierre, probably in Utah, around 1998. Sno-Motor of Ted Flynn's Forest Service, Oregon, 1940. A rear sled allowed steering the vehicle as an articulated vehicle. In the unique front track was located the engine. See Chap 'Change around the track I. Picture from book of Fred Crismon ‘US Military Tracked Vehicles’, Motorbook International Publishers & Wholesalers, 1992. Snowtrak of T.H. Brunius, 1940. The drive train is located inside the tracks. Similar designs were built in 1941 (Sno-Motor) and at the end of WWII (Snow Tractor T 36). Pict from book US Military Tracked Vehicles of Fred Crismon, Motorbook International Publishers & Wholesalers, 1992. Iron Fireman T36 Snow Motor, 1944. 36 were built for the Army. Speed 34 km/h, capacity 260 kg. Engine was enclosed in the tracks and steering was skid steering. Pict from book US Military Tracked Vehicles of Fred Crismon, Motorbook International Publishers & Wholesalers, 1992. Iron Fireman Snow Tractor T36, 99 hp, Dodge or Ford engine. Pict from the book of Bart H. Vanderveen ‘The Observers Fighting Vehicles Directory WWII’. Cargo Carrier T38E1, 1945, with double tracks. Cargo is at rear on sled used also for steering. Pict from book US Military Tracked Vehicles of Fred Crismon, Motorbook International Publishers & Wholesalers, 1992. Sno-Motor, 1941, built for US Forest Service Equipment Laboratory, Portland, Oregon. One track front with a rear sled allowed it to steer by articulation. Snow tractor, 1950. See Chap 'Change around the track I'. Pict from the review 'Popular Mechanics' (French Edition) in Feb 1950. Aktiv Forest Tractor from youtube. Tracked CFP 304 from Russia imported in Europe in the 80s. J M M archives. Trooper of Bombardier Recreational Products, 2004. 20 km/h, capacity 1360 kg, Total mass 5220 kg, Perkins engine 115 hp, hydrostatic transmission, ground pressure : 98 g/cm² to 137 g/cm² loaded, according to tracks width. BRP Inc., Utility vehicles, Granby, QC. Tracked vehicles plant of Granby was sold to Camoplast and then to Prinoth. Prinoth Trooper. Pict J M M at Euroforest, St Bonnet de Joux, 2010 06. Rolba sold Muskeg of Bombardier in the 50s in Switzerland. Pict from the book of Karl Anweiler 'Prototypen und Sonderfahrzeuge der Bundeswher seit 1956', Motorbuch Verlag, 2004. Muskeg Bombardier with amphibious hand-made hull used for mosquito control. Pictures J M Maclou taken at Chindrieux near Le Bourget Lake on 24-25 May 1996. Fire Fighting Muskeg. See chap 'Change around the track I'. Pict J M M, Army Museum, Brussels, 2008 02. Camoplast GT 1200, 2006. Camoplast bought Bombardier plant of Granby in 2004, which sold it at Prinoth, part of Leitner, in 2009. The GT 1200 had a payload of 5,443 kg, for a basic weight of 5375 kg. Cummins engine of 116 kW (155 hp), hydrostatic transmission, speed 15,4 km/h, walking beam suspension, rubber tracks with steel grousers Bombardier type. Camoplast J-5FF, 2006. From a brochure of Camoplast. Sno-Ball Jeep CJ6 Snowcat, 1956. Contract between Jeep and Sno Ball Corp. created this vehicle to transport crews over deep snow. They were provided to the US Forest Service and the FAA. 20 were built in 1956 and only one is remaining. Tracks are rubber belted and the grousers are in steel. This Sno-Ball Jeep stayed in Colorado and was sold in 2004. Sno-Ball Jeep CJ6 Snowcat. Under contract from US Government, Sno Ball Corp. designed this Snowcat with a Jeep engine, transmission and cab in 1956. Original wheels and axles could be mounted back but there was an extra frame lift. Beijing BJ212 field car conversion, tracked, in the 80s. T 26 Cargo Carrier, 1944. Pneumatic road wheel and Bombardier tracks equipped this first prototype. Pict from the review 'Classic Military Vehicle' Feb 2003. Nodwell Scout Carrier Model RN 21, of Bruce Nodwell Ltd in 1957. J M M archives. Versatrac, 1961, commercial version of M50 transporter of Nortronics Division of Northrop Aviation. Speed 56 km/h, 72 hp. During the period of 60s and 70s, much aviation companies were diversifying in off-rod vehicles. Picture from book of Fred Crismon ‘US Military Tracked Vehicles’, Motorbook International Publishers & Wholesalers, 1992. T107 Amphibious Cargo Carrier of Studebaker. 7 built. Picture from the book 'US Military .Tracked Vehicles' of Fred Crismon, Motorbook International Publishers & Wholesalers, 1992. T39 Light Tractor built by Lima Locomotive Works, 1945. In total, 7 prototypes were built. Swamp Vehicle XE-2, 1966. Tested at Fort Eustis, Virginia for Engineer Research and Development Laboratory, Fort Belvoir. The vehicle had an unusual drive arrangement in the form of a paddle-wheel type sprocket in the center of the top track run. SAMT, Sled, Amphibious, Marginal Terrain XE-4, Armadillo, 1966, tested at Aberdeen Proving Grounds by ERDL, Engineer Research and Development laboratories. Belt-type tracks fitted with large steel grousers surrounded aluminum pontoons used also for buoyancy. Mass only 1360 kg. Picture from book of Fred Crismon ‘US Military Tracked Vehicles’, Motorbook International Publishers & Wholesalers, 1992. Peoria Type Reconnaissance Tractor and Syracuse Reconnaissance Tractor, 1920. Gamaunt tracked vehicle, 1956. R. L. Gamaunt, San Pedro, Ca, father of the later articulated 6x6 Gama-Goat, realized several types of cross-country concepts with Twin Coach Cy, Buffalo, NY. Picture from book of Fred Crismon ‘US Military Tracked Vehicles’, Motorbook International Publishers & Wholesalers, 1992. Pack Rat of Twin Coach, Buffalo, New York, about 1960, was the first prototype built by Roger L. Gamaunt, San Pedro, California, before commercial Versatrac. Suspension was very flexible. R. L. Gamaunt designed the emblematic articulated 6x6 Gama-Goat. Picture from book of Fred Crismon ‘US Military Tracked Vehicles’, Motorbook International Publishers & Wholesalers, 1992. O'Laughin modification on Willys MB, about 1942. Picture from book of Fred Crismon ‘US Military Tracked Vehicles’, Motorbook International Publishers & Wholesalers, 1992. Ground Hog 1949 and Oliver T60 Amphibious Cargo Carrier, 1953. Studies were conducted for mobility on marginal terrain such as deep mud or snow which led to the space link track which had grousers enough spaced to hold on the soil and eliminate 'grip failure'. Nowadays, all groomers have space-link-tracks. Picture from book of Fred Crismon ‘US Military Tracked Vehicles’, Motorbook International Publishers & Wholesalers, 1992. Cat Track System of Cat Track Company, Toronto, Canada, on Ford F 100, 1962. Tracks were from Bombardier-type and individual brakes on each side must be added. Additional road wheels were suspended by semi-elliptic springs. Picture from book of Fred Crismon ‘US Military Tracked Vehicles’, Motorbook International Publishers & Wholesalers, 1992. Carrier, 1964. Picture from book of Fred Crismon ‘US Military Tracked Vehicles’, Motorbook International Publishers & Wholesalers, 1992. Allis Chalmers V-40 Scout, 1941. AISV, Amphibious, Infantry Support Vehicle for US Marine Corps, 1967, built by FMC Corp.
C 21, 1948, from Gorki Institute, followed by C-22. Light AT Tractor from Russia. Pictured by J M M at Beltring, GB, on 2004 07 23. Rover Volgar on Internet. Probably a private venture, in 2010. Tracked Vehicle from Russia, on youtube. Makeri tractor of the 80s, from Hiunummentie, Rauma, Finland. J M M archives. Vammas Sergent conversion on Ford 5000, Finland. These overall tracks on agricultural tractor, invented by J A Bombardier in the 50s, were efficient and rather economic. Vammas Tractor VM-84, conversion of a 6610 Ford. From Finland. Ford 7740 with Sure-Trac Kit TM 110 of Ebert Welding Ltd. Pict Francis Pierre in the 90s. Ford F tractor with Trackson full-track conversion. Pict Francis Pierre, about 2000. Fordson F with Trackford full track conversion made at San Francisco. Pict Francis Pierre at Heidrick Ag History Center, Woodland, Ca, 2000. Fordson Johnson Trackpull in the 20s. The Johson Trackpull adapter of the Belle City Manufacturing Company, Racine, Wisconsin, was designed for agriculture. Picture from book of Fred Crismon ‘US Military Tracked Vehicles’, Motorbook International Publishers & Wholesalers, 1992. Cletrac M2, 7 ton, 137 hp Hercules engine, known as High Speed Tractor, produced in 1941 for US Air Force. Track were fitted with rubber pads to preserve runways. Pict Francis Pierre, Caspers, Wyoming, 1998. McCormick-Deering TracTracTor Model T-20. This one is fitted with rubber pads. Pict Francis Pierre, late 90s. Tracked Tractor. Pict Francis Pierre, in late 90s. Eimco 105 excavator, 1956, from Eimco Corp, Salt Lake City, Utah built under licence by St Chamont, Creuzot Loire Group. Pict J M M, Neuf Chef Museum near Thionville, France, 2005 09. Shenwa tracked vehicle model XKL 110, 150 hp Yamnar engine, automatic transmission, total mass 6 t, payload 3 t, from Shandong, China. http://xiankelaimachine. Bear Tractor Inc., 1924, New-York, N. Y.
Deering D tractor, 1938, manufactured by International Harvester Company, Chicago, Illinois. Picture J M Maclou at Compa Museum, Chartres, France on 2004 01. Earl Mallory Tractor T-198 was built at Knights Landing, CA, in 1944 with old surplus parts when new tractors were unavailable. It belonged to Phil Leiser and was gifted to Fred Heidrick, Sr by Leiser familly. 60 hp diesel Cummins engine, 9 t, pictured by J M M at Heidrick Museum, Woodland, CA, on June 2001. HI Renault Tractor, 1920 to 1927, with articulated tracks, at Maurice Dufresne Museum, Azay le Rideau on 2004 10. Pict J M M.
Tractors at Maurice Dufresne Museum, Azay-le-Rideau, on 2004 05 06 : Cletrac, National, Renault, Fendt. Pict J M M.
Old Tractors Show at Souvigné, Poitou, France, in 2004. Below, a Cletrac. Pict J M M.
Straddle tractor Vidal, tested in vines of Azay le Rideau, France, in 1920. Pict J M M at Maurice Dufresne Museum, 4 km of Azay le Rideau, on 2004 05 06. Bamse Bolinder-Munktell BMB 230, whose 732 units have been built from 1957 to 1962. This tractor was a success for forestry work in this period. Mass 3,6 T and 4,3 T total. Volvo acquired BM in 1950. Penguin issued from Mk III of Bombardier in 1946 during Mux-Ox Canadian Expedition. See chapter : J.A. Bombardier : snow travel. Pict : cover of the review 'Science et Vie', Feb 1949. Bombardier amphibian, WWII. Pict from Outlines MV1 of Jeff Woods, Outline Publications, London, 1984. Ratrac imported Thiokol in Switzerland and Europe in the 60s and 70s. Yamnar C50S tracked dumper. Pict J M M at Intermat, Villepinte, 2009 04. Tracks at Intermat. Pict J M M at Intermat, Villepinte, 2009 04. Polytrac tractor was on sale on the site www.agriaffaires.com in 2007. Goldoni Tracked Tractor. Pict J M M at SIMA, Villepinte, 2009 02. Amphib-Alaska amphibious vehicle, 2nd prototype of a true tracked vehicle whose tracks can be raised to travel on water. This experimental Tracked Vehicle seems to be a model 'make it yourself' whose plans were published by 'Popular Mechanics' in early 50s. See Chap 'Thiokol and LMC Tracked Vehicles' where it is mentioned in the third § : this vehicle could probably be a Frandee. Note grousers of tracks in wood. Pict Francis Pierre, Riverton, Wyoming,1998. Thiokol Spryte 1200. See chap 'Thiokol and LMC Tracked Vehicles'. Thiokol Spryte. See chap 'Thiokol and LMC tracked Vehicles'. Thiokol/Ratrac Spryte Amphibian. Pictures J M M at Chindrieux, near Le Bouget Lake on 24-25 May 1996 at EID, Entente Interdépartementale de Démoustication, for Mosquito Control. Thiokol/Ratrac Spryte Amphibian. Pict J M M at Chindrieux, 1996. Pict J M M at Chindrieux, 1996. Ratrac, 1968. J M M archives. sold on ebay in 2006. Takeuchi TL250 Loader. Pict J M M, Intermat, Villepinte, 2009 04. Takeuchi TCR50. Pict J M M, Intermat, Villepinte, 2009 04. Takeuchi TCR50 Dumper. Pict J M M at Intermat, Villepinte, 2006 04. Takeuchi tracked carrier TCR50. Pict J M M at Intermat, Villepinte, 2006 04. Yanmar Transporter from 1993. Pict Francis Pierre, Moerdjik, The Netherlands in 2000. Yanmar Transporter C60R of 1992. Pict Francis Pierre, Moerdjik, The Netherlands in 2000. Takeuchi TL 26 Tracked Loader. Pict Francis Pierre, 1999. Hanix Crawler Transporter RT300, late 1990. Pict Francis Pierre, Moerdjik, The Netherlands in 2000. Crawler, Japanese mini truck, full tracked. Morooka dumper MST-1550VD. Pict J M M at Intermat, Villepinte, 2006 04. Yamnar Dumpers. Pict J M M at Intermat, Villepinte, 2012 04. Morooka MST-300VD R dumper at Forexpo, Bordeaux, 2004 04 21. Pict J M M.
Morooka dumpers, Pict J M M at Intermat, Villepinte, 2012 04. Morooka rubber tracked carrier in the 2000s, from Internet. Victor Bouffort first prototype tracked vehicle, 1952-53. Pict from book 'Hotchkiss 1870-1970' of Daniel Tard, Editor Massin, 1994. VP 90 C of Fouga around 1956. 10 copies were built. Pict from book 'Hotchkiss 1870-1970' of Daniel Tard, Editor Massin, 1994. VP 90 C Tracked Vehicle prototype designed by Victor Bouffort in 1955-56, manufactured by Fouga and enhanced by Hotchkiss. Small and light with 2 lying men crew. Length 3,45 m, height 0.8 m only, Mass 2500 kg, 1600 cm 3 Porche engine. Pict J M M inside Fort of Hackenberg, Maginot line, near Thionville, France in 2005 08. VP 90 Hotchkiss-Brant, 1977 succeeded to VP 90 Fouga. In 1980 Hotchkiss-Brandt was sold to Lohr. Pict from book 'Hotchkiss 1870-1970' of Daniel Tard, Editor Massin, 1994. Suspension VP 90 Fouga, patent from 1955, built in 1956. This system could lower the front and raised rear (or reverse) to easier aim for arms. Pict from book 'Hotchkiss 1870-1970' of Daniel Tard, Massin Editor, 1994. VP90 Fouga. Pict J M M at Saumur Museum, 2000 03. VP90 of Hotchkiss in the 90s, designed by Victor Bouffort and built at the beginning by Fouga. J M M archives. Tracked vehicle of Ordonance Division of FMC Corporation, San Jose, California, 1965. The tracks are those of M113. Pict of 'The Engineer', July 1965. Tracked Peugeot test, 1923. Pict from VM International 1986 08-10. Roadless County CD 50 long and wide tracked swamp tractor in Ireland peat in the 50's. Pict from book 'Roadless County' of Allan Condie, Allan Condie Publications, 1993. County swamp crawlers about the 50s for working in peat-bog of Ireland. The wooden tracks (oak) are 76 cm wide. Upper : County Full Track, lower : Board-na-mona tractor. Picture from book ‘County, a Picturial Review’ of Stuart Gibbard, Farming Press, 1997. 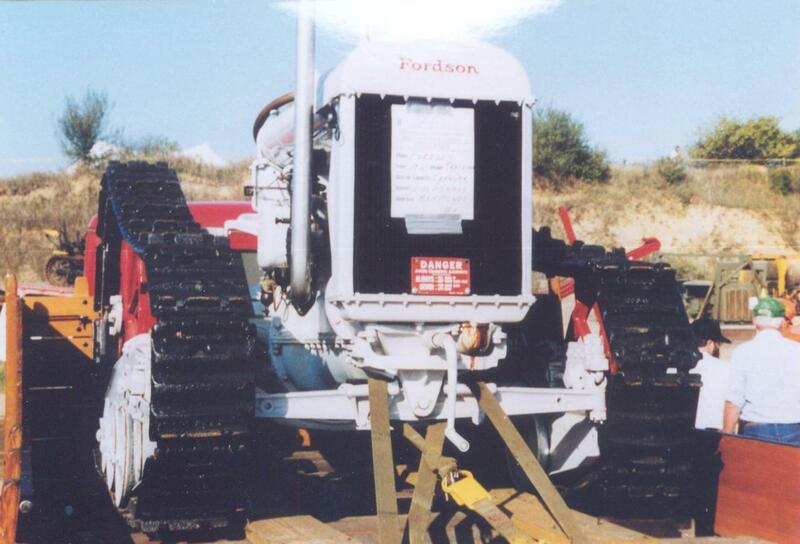 Neil Godsman tracked low ground pressure trailer of Aberdeen, 700 mm tracks wide provide 0,14 kg/cm² of ground pressure at the price of £ 5.600 in 1983. For working in peat. Pict of review Power Farming, Aug 1983. Track conversions on Ferguson tractors in the 50s. : Upper : Conversion of Bamford and Cameron. Lower : Conversion of Burdge. Pict from 'Tracteur Retro Special Ferguson', 2011. Forestry KT12-MTZ Tractor, 1948 at Kirov plant and at Minsk from 1951 to 1956, 45 hp, 12,3 km/h, 2415 kg. It is the same model, more recent. Oxtrac of Tremzac. Tremzac, founded in 2001 at St Bonaventure near Drummonville is a subsidiary of Machineries Tremzaction. In 2008, Tremzac acquired all the rights of multi-task tracked vehicle Oxtrac. Pict J M M at Euroforest, St Bonnet de Joux, 2010 06. Ox of Tremzac, Quebec. Pict J M M at Forexpo, Mimizan, France on 2012 06. Telakarhu tracked vehicles, Finland http://www.karhunpoika. Snow Groomer Bächler in the 70s, from Bächler Top Track AG, Auw, Switzerland. Now this brand built only attachment for snow-grooming. Pict collection of Francis Pierre. Ardco Driller's Rig of the 80s. J M M archives. SAME Explorer 75C76 Mulcher used for mosquito control on shores of Lac du Bourget, France. J M M, May 25, 1996. Pierce FTS 170 Fastrack Skidder from Pierce-Pacific MFG, Inc., Tualatin, Oregon, always exists. F. Pierre archives. Overland, Johnson, Light D Tank, 1922. Suspension bogie systems were designed for high speed. Pict from the book of Bart H. Vanderveen ‘The Observers Army Vehicles Directory from to 1940’, Warne 1972. Ordnance tractor, Amphibious, 1918-19, designed by Colonel Chase. Payload 226 kg, Speed 48 km/h. Pict from the book of Bart H. Vanderveen ‘The Observers Army vehicles Directory to 1940’, Warne, 1974. Landswerk 132 tractor, from Sweden, 90 hp, 5.5 tons, speed 24 km/h. It was commercially available. Pict from the book of Bart H. Vanderveen ‘The Observers Army Vehicles Directory from to 1940’. Hornsby Tractor, 1905, 20hp, oil engine, with a crawler conversion of 1896. It was the first crawler without tiller wheels and fitted with brakes on each track. Patent will be bought by Benjamin Holt and well exploited. See chap 'Changes around the track'. Hytracker Amphibious of Craig Caledonia Company Ltd, Buchlyvie, GB. Ford 98 hp engine, Hydrostatic drive, 38 km/h, rubber tracks with steel grousers. Collection of Francis Pierre. Vermeer tracked loader. Pict J M M at Intermat, Villepinte, 2006 06. Tracked vehicles from Russia with civilian body. In the 2000s. Right below is Kinechma. Weasel of 'Expéditions Polaires Françaises'. Pict J M M at Rétromobille, Paris, 2007 02. Weasel of French Polar Expeditions in the 50s. Pict J M M at Rétromobile, Paris, 2007 02. Amphibious Weasel. Pict J M M at La Ferté Alais, 2008 06. Studbaker Weasel M29C, Amphibious, 65 hp, mass 2172 kg, payload 545 kg, 58 km/h. From USA, WWII. Pict J M M at Liberty Museum, Overloon, The Netherlands, 2009 03. Cletrac M2 High Speed Tractor of US Air Force during WWII. Pict J M M at Liberty Museum, Overloon, The Netherlands on 2007 04. Cletrac M2, WWII. Pict J M M at Overloon, The Netherlands, 2009 03. Linn tracked Trailer in the 40s. Pict J M M at Liberty Museum, Overloon, The Netherlands, 2007 04. Trailer, Track-Laying, 8 Ton, Linn, capable of carrying heavy load for sustained periods but speed was only 24 km/h on road and 3 off-road. High turning radius of 19,8 m, with a high level of noise of the un-lubricated tracks. Pict J M M at Liberty Museum, Overloon, 2009 03. Dorotea Amphibian, from Sweden. See also page 21. Truxor Amphibious vehicle of Dorotea, Sweden. Pict J M M at Intermat, Villepinte, 2012 04. Truxor Amphibious from Sweden. Pict J M M Intermat, Villepinte, 2009 04. Dorotea Truxor Amphibian from Dorotea Mekaniska AB, Sweden. Ecotec Mecato Chargeur in the 80s. J M M archives. Doll Tractor Typ RF 15.400, 2000. It has 80 cm tracks width, air suspension, hydrostatic drive, 200 -600 hp engine and speed 30 km/h. Doll Fahrzeugbau AG is at Oppenau, Germany and build special trucks. Bulldog from Union Tractor Co., San Francisco, 1917. Fitted with rather unusual track suspension in arch may have used a solid type track. Pict from the book of James A. Young & Jerry D. Budy : ‘Endless Tracks in the Woods’, Crestline, Motorbooks, Osceola, 1989. Fordson with Roadless tracks in early 30s. Pict from book 'Roadless County' of Allan Condie, Allan Condie Publications, 1993. Roadless Traction of Roadless County full tracked E27N crawlers produced in 1954 under the name of J17. The tracks are rubber jointed. Pict from book 'Roadless County' of Allan Condie, Allan Condie Publications, 1993. Terraflex Otico, Chalmaison, France. This rubber tracks company was founded in 1971. J M M archives. U.emme sovemente s, 1996, from Modigliana, Italy. Collection Francis Pierre. Protrac Rubber-track for skid steering loader. Bofors Tractor FM32, 1932, derived from an agricultural tractor. Pict from the book of Bart H. Vanderveen ‘The Observers Army Vehicles Directory from to 1940’, Warne, 1974. AOM tracks for wheeled loader. Pict J M M at Intermat, Villepinte, 2006 06. Hiller of Pist and Terranteknik, 2000, Sweden. This tracked vehicle was distributed by Argo and Crayford. Over 800 were built and sold all over the world about 2003, particularly in Scotland. A more recent model was called Gauron. Fordson Roadless, 1930. Pict from the book of Stuart Gibbard, 'Roadless', Farming Press, 1996. Samson Roadless, around 1920. Pict from the book of Stuart Gibbard, 'Roadless', Farming Press, 1996. Waveless road roller, 1926, with Orolo tracks, built by J Allen & Sons, Oxford. Pict from the book of Stuart Gibbard, 'Roadless', Farming Press, 1996. Meili tracked vehicle in the 80's. Hydrostatic transmission, 52 hp. J M M archives. Proferram tracked tractor from Czech Republic in the 80s. J M M archives. Gregoire rubber tracked tractor TC 160. Mass 7500 kg, 160 hp, Hydrostatic transmission, 20 km/h. At Chateaubernard near Cognac, France, in the 80s. J M M archives. Uhtysha tracked home made vehicle, 2010. T 42, 1948, this is a prototype from Gorki Institute, in response to Bombardier Snow-mobile tested in USSR. The T-42 lacked power, reliability and was not easy to steer. In the same time, the C 20 was built. Oural ATV designed in 1943-44 at Motorcycle Irbit Plant IMZ. Engine was that of a motorcycle M72 and tracks made of rubber. Tested in Feb 1944, it failed due to broken gearing and was cancelled. Nami-0103 (1 t), 0105 (2 t), 0114 (20 t) of the 60s and 70s. Snow Gott of Vic Elford en 1974. Pict of the review 'Action Automobile et Touristique', Dec-Jan 1975. Snow-Gott. Pict from the reviw 'L'Auto-Journal', Feb 1975. Auto-Track, 1921, of Auto-Track-Tractor Syndicate, San Francisco produced from 1921 to 1924. Buda engine and use of 50 rollers bearing in the tracks, mass 4,535 kg. Büssing tractor prototype, 1919, from Braunschweig, Germany. Pict from the book of Wolgan H. Gebhardt : 'Deutsche Raupenschlepper', Schrader Verlag, Stuttgart, 2000. D.K. Karelskihh from Russia in the 20s. Pict from book of Alain Dupouy, Auto-éditeur : 'Les véhicules tout-terrain N° 11 Tome I'. 1995. Dürkopp tractor, 1924, from Dürkopp-Werke AG Bielefeld, Berlin, Germany. This brand only lasted from 1924 to 1927. Pict from the book of Wolgan H. Gebhardt : 'Deutsche Raupenschlepper', Schrader Verlag, Stuttgart, 2000. Uranus crawler, 1939, from Uranus Traktoren AG, Switzerland. 30-40 hp, 2.300 kg. Pict from the book of Richard H Robinson: ‘Crawler Tractor Scrapbook’ Part Three, Country Life Ltd, New Zealand, 2000. Credit : Franz Morgenegg's book 'Vevet'. Uranus C of Sisma, Milan, patented Mommenday tracks, from 1952 to 1959 whose 28 units were manufactured. Pict from Review 'Tracteurs Passions et Collections', May-June 2012, Histoire et Collections, Paris. Faure Uranus TU-125, 1947-56 of CFAMH, Compagnie des Forges et Aciéries de la Marine et d'Homécourt and later by CAFL, Compagnie des Aciéries et Forges de la Loire. It was equipped with Salmson then Delahaye engines. It's in fact a patented Mommenday re-bodied. Speed 12 km/h. Rubber plates or metal pins could be fitted on the track. 102 tractors were built between 1947 and 1949. Pict of the book : ’Histoire des Tracteurs à Chenilles en France’ de Jean Noulin, ETAI, Boulogne-Billancourt, 1997. St Chamond tractors, 1953. TVD had Uranus track and PM1 (2 lower pictures) with Perkins diesel engines had conventional tracks. In 1954, the company became CAFL, Compagnie des Ateliers et Forges de la Loire, St Chamond, Firminy, St Etienne. PM2 tractor was then unveiled. http://mototracteurs.forumactif.com/t2544-les-chenillards-st-chamond ; pict of the book of St Chamond. La Licorne LW Tractor, 1948. This old company of Courbevoie, France, bought, like Faure-Uranus, the patent of tracks Mommenday and built the LW but only 10 units were built in 1948 and 21 in 1949, due to premature wear of the tracks. La Licorne was bought by Berliet in 1949.
machinist.com/vb/antique-machinery-history/ot-crawler-tractors-196276/index15.html. Pict from Garrett diesel tractors by RA Whitehead, 1964. Hurlimann model MS, 1938, primarily for snowy terrains, from Switzerland. 70 hp. Pict from the book of Richard H Robinson: ‘ Crawler Tractor Scrapbook’ Part Three, Country Life Ltd, New Zealand, 2000. Credit : Franz Morgenegg's book 'Vevet'. John Ohrn tractor, 1965, from Sodertalje, Sweden. Pict from the book of Richard H Robinson: ‘ Crawler Tractor Scrapbook’ Part Three, Country Life Ltd, New Zealand, 2000. Linke-Hofmann-Busch tractor, 1931, 55 hp. Articulation of the suspension follows uneven terrain. Known brands like Famo, Hanomag, KHD (Deutz), Lanz made a wide variety of tracked tractors. Pict from the book of Wolgan H. Gebhardt : 'Deutsche Raupenschlepper', Schrader Verlag, Stuttgart, 2000. Multi-Cat of Meili, end of the 60s. It was a personal carrier. See chap 'Meili tractors and Gama-Goat'. Picture from book of Gerold Röthlin ‘From Autotractor to modern special vehicles’ from Verlag Gerold Röthlin, Kriens, 2004. OTO C40C, 1957, from Milano, Italia. Pict from the book of Richard H Robinson: ‘Crawler Tractor Scrapbook’ Part Three, Country Life Ltd, New Zealand, 2000. Raimondi Bruco, 1953, 30 hp, 14,5 km/h. Pict from the book of Richard H Robinson: ‘ Crawler Tractor Scrapbook’ Part Three, Country Life Ltd, New Zealand, 2000. Scheuch tractor, 1945, from Erfurt, Germany. Pict from the book of Wolgan H. Gebhardt : 'Deutsche Raupenschlepper', Schrader Verlag, Stuttgart, 2000. Vevey MC2 proto, 1943, from Switzerland. Pict from the book of Richard H Robinson: ‘Crawler Tractor Scrapbook’ Part Three, Country Life Ltd, New Zealand, 2000. Credit : Franz Morgenegg's book 'Vevey'. Varmit tractor built in Portland, Oregon about 1979. Pict of the book of Richard H Robinson: ‘ Crawler Tractor Scrapbook’ Part One, Country Life Ltd, New Zealand, 2000. Fordson-Poutilovets tractor, 1929, with Alvatracks in Russia, 1929. Pict from book of Alain Dupouy, Auto-éditeur : 'Les véhicules tout-terrain N° 11 Tome I'. 1995.
but the rubber were out fast. model/pic-HG.html, from the Oliver Shield - Vol. 15, No. 1 (Dec-Jan 1946-47). Cletrac and Oliver tractors, above and center : Oliver Cletrac HG, 1947, below : HG OC 3. Cletrac rubber tracked crawler model HG, 1945-48. Pict from book of P. A. Letourneau : 'Cletrac and Oliver crawlers', Iconografix, Osceola, 1996. Roadless tracks on 1937 Fordson fitted with swamp shoes. Despite their width, the machine dug in peat bogs when applied a slight pull on the drawbar. Pict from book 'Roadless County' of Allan Condie, Allan Condie Publications, 1993. Roadless County Case L before WWII, used as a lifeboat at RNLI. Pict from book 'Roadless County' of Allan Condie, Allan Condie Publications, 1993. Murco Swamp Trac, 1963, from Murco, Dover, Delaware. From ebay. KASTOR-II of Scop Sagne, 2005. 59 KW, hydrostatic transmission, Scop Sagne is at Péchaudier, France. Oliver tractor with wooden tracks for swamps. Jeep CJ5 with Wagner Tracks, 1969 (formerly Uni-Trac). With a speed 24 km/h, it included a steering system by brakes. Pict from 'Construction Equipment and Materiels', May 1969. Pict collection of F. Pierre. Otter Amphibian of Pontiac was built from the early to the end of the 50s as T46E1. 127 hp engine, payload 1360 kg for 3.9 t empty mass, speed 45 km/h, a propeller was fitted for amphibious operations. Pict from the review 'Military Machine International', May 2003. M76 Otter amphibian in Alaska. Pict by Jerry Park, Alaska, in the 60s. Voisin amphibious tracked vehicle, 2,5 t, 1953, at Etangs de Saclay, France. Pict from the book ‘Les véhicules Hors série’ of Jacques Borgé and Nicolas Viasnoff, Balland, 1976. Snow groomers from the excellent site www.pistenraupe.de that presents about 80 brands of snow groomers and tracked vehicles, whose many unexpected : L to R and A to B : Fendt, Käsbohrer 300 Polar, Montaz Montino, Kässbohrer, Ratrac. Pisten Bully 600W with cable winch from the groomer to a fixed point allowing grooming on steep slopes 45° and more. Pisten Bully 600 of Kässbohrer. Pict J M M at Le Lioran, France, on 2011 08. Pisten Bully Kassbohrer and cable for moving in steep slopes. A winch is mounted at the rear of the cab. Pisten Bully 100 of Kassbohrer in sand. Sigal M25 groomer, in the 80s, of Lecointre Company, Sèvres, France, was a subsidiary of Renault. It was chosen for Air Force to replace Snow-Trac. Hydraulics were from Yumbo. www.forum.aceboard.net, which seems unfortunetly shut since 2012 08. Flexmobil Kässbohrer, Laupheim, Germany. The first tracked Flexmobil appeared in 1983 and Pisten Bully was a snow groomer. Flexmobil could receive a tracked (hydraulically driven or not) trailer from 2 t to 4 t and as semi-trailer. The whole was not an articulated vehicle but a tractor with detachable trailer. J M M archives. Flexmobil Kässbohrer and the trailer. J M M archives. Hotchkiss TTC 50, early 60s. Pict from the book 'Hotchkiss 1870-1970' of Daniel Tard Massin, early 2000. Hotchkiss HB 40 created in 1965 on demand of Paul Emile Victor, of French Polar Expeditions. It was designed by Victor Bouffort. Engine120 ch, 20 km/h in snow and 70 km/h on road. 12 persons could sit inside. Pictured by J M M at Rétromobile, Paris, in 2007. Hotchkiss HB 40, 1965. Pictured by J M M at Rétromobile, Paris, in 2007. Tracks of Hotchkiss HB 40. Pict J M M.
Hotchkiss HB 40 from early 60s, designed by Victor Bouffort for EPF,Expéditions Polaires Françaises. Payload 1,5 t , empty 2,5 t, ground pressure 120 g/cm² with rubber widener. 11 were built between 1964 and 1968. Pict J M M at Loco en Fête, La Ferté Alais, on June 1996. Hotchkiss HB 40. Pict J M M.
General Transport vehicle NSU-Werke designed for mountain use in 1956-57 and tested in 1961-62. Mass 2,4 t, 60 km/h, 52 hp Porsche engine. Only 3 built. Unitrac UT 90 Unimog of Tractortecnic Company of Gevelsberg, Germany. It was issued from Unimog U 421 and 406 of the late 60s for cab, engine, and transmission. 100 copies were built ; only 20 survived. RSO, Radschlepper Ost, Tracked Tractor, East, 1942, by Steyr. 28000 units were built between 1942 and 1945 by Steyr, Klochner-Deutz-Magirus and Wanderer. Suspension by quarter-elliptic springs was very simple. J M M at Sinsheim Museum, 2004. Motormuli M80, 1959. Steyr engine of 5322 cm3, 80 hp. Pict from the book of Karl Anweiler 'Prototypen und Sonderfahrzeuge der Bundeswher seit 1956', Motorbuch Verlag, 2004. Motor Muli M30-M60 tracked vehicle, 1956. Steyr engine. http://www.doppeladler. Dodge with Chase Track System. http://strangernn.